When her fiancee (Walter Janssen) is abducted to the other side by Death (Bernhard Goetzke), a young woman (Lil Dagover) begs him to send her man back. Agreeing to do anything to reclaim him, Death sets her a challenge – he will return her partner to her, if she can make love survive in at least one of three different historical stories. 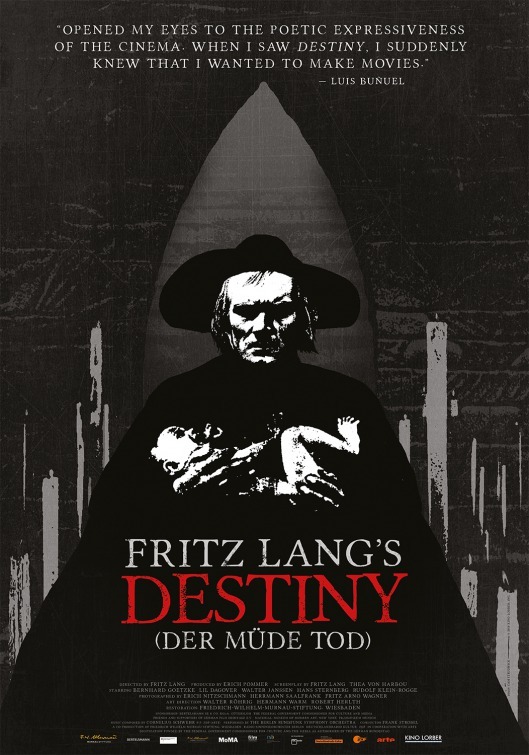 Director Lang started to show his worth in the early 1920’s with atmospheric, haunting thrillers and morality dramas, such as this clever piece that literally translates as The Wary Death. More than just wary, Death is actually perpetually pissed off. Played by lanky, hollow cheeked Goetzke, he is as grey and zombie eyed as has ever been imagined and may have influenced Ingmar Bergman and actor Bengt Ekerot when making the seminal The Seventh Seal (1957), in which Ekerot’s Death memorably played Chess with medieval soldier Max von Sydow in return for his life. One of the central tenets of expressionist cinema is that actors emote with exaggeration of outward behaviour and gesticulation to represent inner psychological torment and madness. Goetzke plays things decidedly smaller in scale, barely moving his mouth when he talks. Death’s mannered obtuseness contrasts well with the drunken, noisy chatter of the town council, who ostracise and gossip about him, until he passes them gold pieces to sway his planning application for a walled garden. The film’s creepy, murderous tone is greatly helped by his performance. Lil Dagover, the famous expressionist leading lady (The Cabinet of Dr Calagari, 1920, Tartuffe, 1926 and three other films for Lang) enjoyed substantial fame in Europe during this period and into the 1930’s (Hitler was a fan and on several occasions she had dinner with him). Here, she has one of her more demanding silent roles, playing the lead female characters in all four story segments: a Muslim Princess, an Italianate lady and a Chinese woman. She is stronger as the innocent girl in the Germanic fable that frames them, easily moving from wide-eyed, youthful love to calculating mania as she hunts for a willing victim to euthanase for Death, to resurrect her dead lover. Lang’s wife-to-be von Harbou co-wrote many of the scripts for his movies and was a substantial creative force behind him and German cinema for the next decade. The story here is an ingenious portmanteau narrative. Seemingly simple on the surface, it is deceptively complex, peppered with astute ideas that lead to the striking imagery associated with silent cinema. There is no specific date and time for when the story behind, though judging by the antique mail coach it is set well before 1921. This helps Lang and von Harbou create the dreamlike atmosphere of the film. If Goetzke’s acting evades expressionism the morbid landscape around the little town, with its twisted trees, deep roots exposed to the air, and jaggedly rolling hills, does not. Death’s cathedral of candles is a beautiful thing to behold. Streaks of white stretch high into the buttresses, the flickering lights represent a human soul. They dance carefree…until Death decides to extinguish them. His judgement on life is random and cruel; he casually selects a new-born baby, letting Dagover and the audience witness the mother’s grief. Three of the finest visualists of the period designed the sets and costumes for this film, each responsible for a different but incredibly detailed look. Walter Rohrig created the German sequences, Hermann Warm realised the Persian and Venetian sections (complete with canals, Gondolas and a bare-breasted woman during a celebration) and Robert Herlth splashed out on the lavish Chinese pagodas, stone bridges and bamboo forests. Although mouldy looking to eyes used to CGI, the photographic effects are still impressive for a film of the time. Dagover sees Death’s latest recruits, including her fiancee, march toward and then through her; a paper scroll arises and flies off; a miniature army appears from under a Chinese magician’s robes. And finally, as always, its tempting to see some ‘Trumpian’ symbolism in a film, no matter how long ago it was released. Death builds a wall as high as possible to stop the townsfolk peering into his garden. There’s no need for a Visa here, one needs only give their soul to have an eternal wander. Let’s hope, in our ever-changing modern world, thing’s never become this desperate. Writers: Fritz Lang, Thea von Harbou. Camera: Bruno Mondi, Erich Nitzschmann, Herrmann Saalfrank, Bruno Timm, Fritz Arno Wagner. Music: Giuseppe Becce, Karl-Ernst Sasse, Peter Schirmann. Sets: Robert Herlth, Walter Röhrig, Hermann Warm. Lil Dagover, Walter Janssen, Bernhard Goetzke, Hans Sternberg, Karl Ruckert, Max Adalbert, Wilhelm Diegelmann. Demon Seed (1977). Film review: 3 out of stars for this chilling but overdone thriller.